For any dog owner who’s ever felt compelled to wrap or tug on their leash, this ergonomic leash grip adds leverage where you need it. Made from lightweight, recycled plastic, Lead Mate will fasten onto any flat leash. Unscrew and reposition for better lead and comfortable grip. Dimensions: 2" x 2" x 1.625"
Received my order very quickly and it works very well. I've been having a problem with my hand hurting because my 95 pound dog tends to pull a lot. I put this on the leash just below the handle and it definitely helps me keep a better grip without hurting my hand. Great addition to my leash. I walk my 100 lb. Lab on a lunge line. The lead mate means the the lead doesn’t slip through my hand. Placed about 12" to 18" from the lead's snap, it makes a great hand grip to give control to manage the dog in cases of approaching cars, lunging, or pulling. 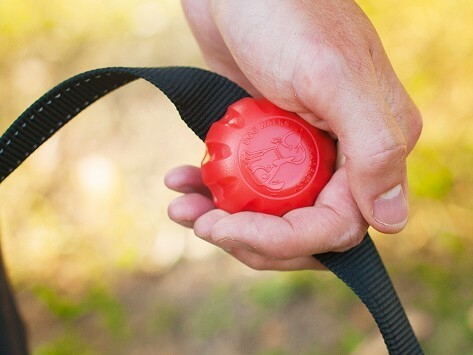 This ergonomic leash grip gives you a secure, comfortable handle to walk your dog. 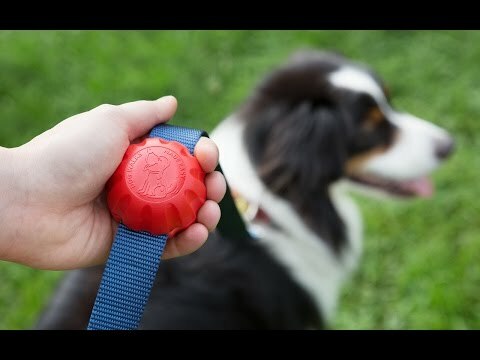 Lead Mate is a sphere that fastens to the fabric of your leash, letting you hold on where is best for you—without wrapping the leash around your hand or knotting it. You’ll avert rope burns and wrist strain, while you teach your dog good habits. Lead Mate gives you more control so that you have to do less pulling on the leash. Made from recycled plastic, it’s lightweight and easy to reposition when different people want to man the leash. This gives the whole family a good, hazard-free grip on the dog. Maker Jaan Hurditch reengineered the leash knot to a simpler, sleeker sphere that feels secure and doesn’t hurt.